Markets failed to sustain early gains and closed flat with a negative bias as investors prefer profit booking at higher valuations. Mumbai: Markets failed to sustain early gains and closed flat with a negative bias as investors prefer profit booking at higher valuations. While auto sector performed higher with Tata Motors reporting better-than-expected sales in US. The benchmarking indices dragged by private banks, healthcare, technology and select oil stock, while auto shares extended support. 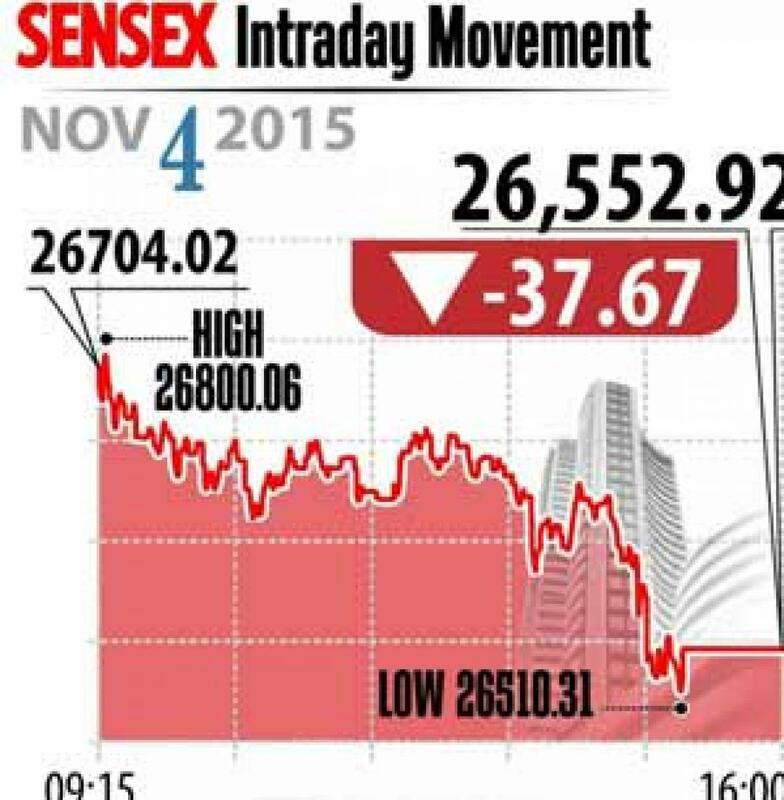 Sensex closed at 37 points down at 26,553 and Nifty declined 21 points to close at 8,040. Meanwhile, the broader markets registered flat with midcap index ended 0.2 per cent higher; smallcap index declined 0.3 per cent. On the sectoral front, eight out of 12 sector indices ended in red with IT and Healthcare indices losing 0.5 per cent, however, auto index outperformed to close 1.6 per cent higher. In the auto pack, Tata Motors raised about 6 per cent following better than expected auto sales in US. MotoCorp gained over 1 per cent, M&M and Bajaj Auto gained 1.9 per cent and 1 per cent, respectively. IT shares reported down on the profit taking with Tech Mahindra closing 2.5 per cent lower and other IT peers, TCS and Wipro down 0.2 to 0.7 per cent, following appreciating rupee. The gainers: Tata Motors, up 6.02 per cent at Rs 405.05; Mahindra and Mahindra (M&M), up 1.71 per cent at Rs 1,253.90; Coal India, up 1.40 per cent at Rs 330.25; Hero MotoCorp, up 1.19 per cent at Rs 2,614.40; and Bajaj Auto, up 1.13 per cent at Rs 2,448.75. The losers: ICICI Bank, down 2.06 per cent at Rs 273.40; Gail, down 1.92 per cent at Rs 301.55; Sun Pharma, down 1.84 per cent at Rs 852.35; RIL, down 1.48 per cent at Rs 952.10; and Lupin, down 0.76 per cent at Rs 1,859.35.